[Oakland, California, USA] – A gifted young dancer is heading to Chicago this summer for a five-week intensive study with the prestigious Joffrey Ballet — followed by another three weeks of training with the American Ballet Theatre (ABT) in Los Angeles. Harwood was selected for the summer intensives out of thousands of applicants who auditioned. Not only did he land the spot, he received a full scholarship for tuition from Joffrey and 50-percent paid tuition from ABT. However, with just a week to go before he boards the plane for Chicago, Harwood still needs to raise money for other expenses, such as room and board, airfare for himself and his mother — who will drop him off and pick him up in Chicago and Los Angeles — as well as hotel bills and special attire required by each ballet company. Saunders said she is deeply grateful for everyone’s generosity. “Ballet is Jed’s entire life, so we are willing to do whatever is necessary for him. 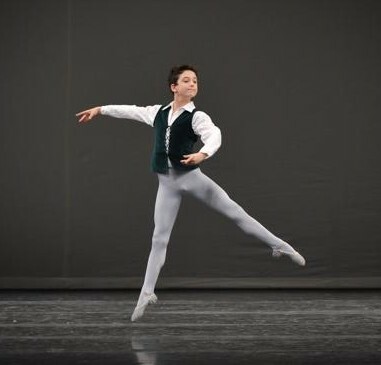 Harwood, who takes six or seven classes a week at the Conservatory of Classical Ballet in San Leandro, is one of the youngest students attending this year’s summer intensives at Joffrey and ABT. However, he looks forward to the opportunity of immersing himself in what he loves — he will be taking classes eight hours a day, five days a week in everything from technique to character interpretation. 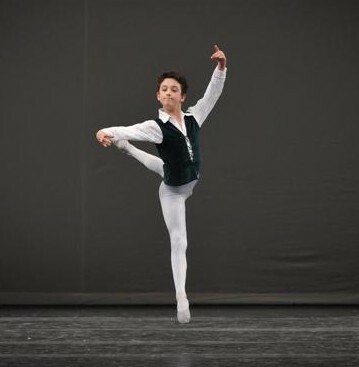 “I just love how dance expresses music through motion; ballet is so fluid, all the steps just link together,” said Harwood, who is in rehearsal for the 2 p.m. June 6 performance of “Coppelia” at the San Leandro Performing Arts Center. (For tickets, visit http://www.sanleandroperformingartscenter.com/ under Events). Ann Fisher is owner of the Conservatory of Classical Ballet and has been Harwood’s teacher for the past four years.